MIT researchers have demonstrated a new way to store unused heat from car engines, industrial machinery, and even sunshine until it’s needed. Central to their system is a “phase-change” material that absorbs lots of heat as it melts and releases it as it resolidifies. Once melted and activated by ultraviolet light, the material stores the absorbed heat until a beam of visible light triggers solidification and heat release. Key to that control are added molecules that respond to light by changing shape—from one that impedes solidification to a different one that permits it. In a proof-of-concept experiment, the researchers kept a sample mixture in liquid form down to room temperature—fully 10°C below where it should have solidified—and then, after 10 hours, used a light beam to trigger solidification and release the stored thermal energy. PCMs have thus proved a highly successful means of storing thermal energy, but getting it back out in a useful way has remained a challenge. “What we needed was a trigger that would give us control over the timing of the heat release,” says Grossman. A few years ago, Grossman began to wonder whether he might already have the trigger he needed. In related work, his group had been studying the storage of energy in special molecules known as photoswitches. Shine a certain wavelength of light on a photoswitch, and its shape will change. The same atoms are present, but their orientation relative to one another shifts. Moreover, they’ll stay in that shifted configuration until they’re exposed to another wavelength of light. Then they’ll snap back to their original shape, in the process releasing thermal energy. Grossman’s group has made good progress on designing photoswitches for storing energy, but the molecules have a key limitation: They can be switched into their energy-storing configuration only by light. As a result, they can’t be “charged” using waste heat from cars and machines and sunshine. 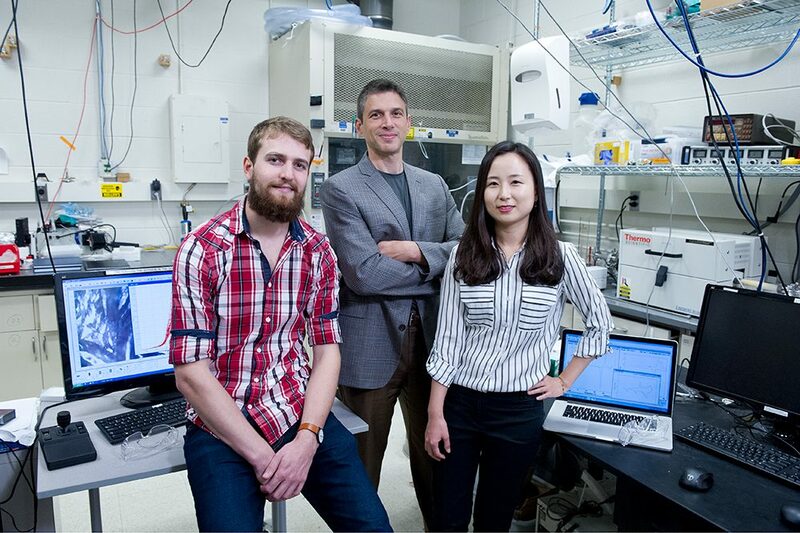 So Grossman and former postdocs Grace Han and Huashan Li of materials science and engineering began examining the possibility of using a photoswitch in a new way—as a trigger for controlling the release of energy from a phase-change material. “We could tailor its chemistry so that it matches the phase-change material really well when it’s in one form, but when we switch it, it doesn’t match anymore,” explains Grossman. If mixed with a melted PCM in the mismatched form, the photoswitch would keep it from becoming a solid—even below its normal solidification temperature. Shining a different wavelength of light could change the photoswitch back to its matching structure. The PCM would then solidify, releasing its stored latent heat. To explore the viability of that approach, the researchers used a conventional PCM called tridecanoic acid and prepared a special variation of the photoswitch molecule azobenzene, which consists of two linked rings of atoms that can be in different positions with respect to one another. In the “trans” form of the molecule, the rings are flat—its naturally occurring ground state. In its “cis” form, one of the benzene rings is tilted at 56° relative to the other one. It switches from one shape to the other in response to light. Shine ultraviolet (UV) light on the flat version, and it’ll twist; shine visible light on the twisted version, and it’ll flatten out. The figure below shows what Grossman calls the thermal energy storage and release cycle and illustrates the role played by the azobenzene photoswitch as a low-concentration “dopant” (a material added to alter the properties of a substance). When the PCM-azobenzene mixture, or composite, is solid with the azobenzene in its trans form, the two constituents pack together tightly, as shown in drawing A. When heated, the composite absorbs thermal energy, and the PCM melts (drawing B). Zapping it with UV light changes the azobenzene dopant from trans to cis, indicated by the hooked ends in drawing C. When that mixture cools, the cis azobenzene prevents solidification of the PCM, so the latent heat remains stored (drawing D). Illumination with visible light switches the azobenzene back to its trans form. The mixture can now solidify (drawing A), in the process releasing its stored latent heat. The thermal energy storage and release cycle In a solidified sample (structure A), crystals of the PCM and the azobenzene photoswitch in its trans form pack together tightly. The cycle proceeds as follows. Step 1—Heat the solid composite above the melting point of the PCM. It becomes a mixture of molten PCM and crystals of the azobenzene dopant, which has a higher melting point (structure B). Step 2—Shine ultraviolet (UV) light onto the mixture (and keep heating it so it stays melted), and the azobenzene dopant switches from trans to cis (the form with the twisted ends) and disperses into the liquid PCM (structure C). Step 3—Cool the composite to a temperature below its solidification point. The cis azobenzene dopants keep the PCM molecules from aligning, so the mixture can’t solidify; it remains in its liquid form (structure D). Step 4—Shine visible light onto the mixture so that the cis azobenzene dopant changes back to its trans form. The PCM molecules and the trans dopant can now stack tightly, so the composite immediately solidifies (structure A), releasing its latent heat. When the researchers didn’t shine the visible light on their mixture, they found that it remained a liquid at temperatures below its original solidification point for 10 hours. The mixture then gradually began to solidify, giving off its stored heat. To demonstrate the durability and repeatability of the system, the researchers switched it back and forth—between charging and discharging—100 times over more than 50 hours. During the initial discharging step, the crystallinity of the PCM changed slightly from the starting material, but after that, its structure remained unchanged. Other tests confirmed the importance of carefully selecting or designing a photoswitch that interacts effectively with a specific PCM. Again, the photoswitch must mix well with the liquid PCM to form the composite and must change—when activated by light—between two distinct structures that blend with or interfere with the packing of the selected PCM. The researchers also found that optimizing the concentration of the photoswitch in the PCM is critical. When it’s too low, it won’t interfere with solidification. When it’s too high, the ultraviolet light may not penetrate the mixture completely, and the dopant molecules may react with one another, clumping together rather than distributing well and preventing PCM packing. Grossman stresses that the work thus far is a proof of principle. “There’s a lot of work to do to make applications based on this concept,” he says. But the researchers envision the following type of device. The mixture would be held in a container with windows that could be covered to control light intake. A heat exchanger would deliver thermal energy from the sun or another source to the PCM composite, and a separate LED or gas-discharge lamp would simultaneously send UV light in through the uncovered windows to charge the azobenzene dopant. The windows would then be covered to enable thermal storage, even as the mixture dropped to room temperature. When heat release is desired, the windows would be uncovered, and the liquid composite would be exposed to ambient light or to blue LED light for a faster response. The windows would be made of common borosilicate glass, which would transmit over 90% of the relevant UV and visible light, and a stirrer inside the container would help to keep the azobenzene molecules from sticking together. Grossman’s group is continuing work to apply and improve the thermal storage concept. For example, they’re examining its possible use as a novel system for de-icing—a topic of ongoing interest to Grossman, who notes that today’s electric cars consume so much battery power for de-icing and heating that their driving range can drop by 30% during cold weather. A far better approach would be to store thermal energy in a thin, transparent film and trigger a blast of heat when it’s needed to melt that troublesome layer of ice. “With that in mind, we wanted to see if we could make thin films of our material over larger areas and have it exhibit the same behaviors we saw in our lab samples,” Grossman says. They deposited their liquid PCM composite on a sheet of glass, put another sheet on top, and sealed it up. They found that they could charge up the mixture with UV light and then discharge it later with visible light, getting the stored phase-change energy back out as heat. Moreover, they could do it selectively so that part of the film solidified and the rest remained liquid (see the photos below). Other work focuses on designing a solar cooker that can store heat after the sun sets—for longer than the 10 minutes typical of today’s best models, which still rely on conventional PCMs for storage. A PCM composite could do better, except for one drawback: As it goes from solid to liquid, it also changes in volume—potentially enough to damage the container. To prevent that behavior, Cedric Viry, a graduate student in materials science and engineering and a fellow in the Tata Center for Technology and Design, is working to encapsulate the composite inside tiny beads with shells made of silica or calcium carbonate. The confined composite will go through the necessary phase changes, but the strong shell will limit the massive volume change that occurs in an unconfined mixture. The encapsulated beads could be suspended in other liquids, and better methods of delivering light into the materials might be possible. “Once we get the micro-encapsulation to work, there will be many more applications,” says Grossman. Finally, the researchers are extending their concept to different materials and temperature ranges. “We’ve figured out some interesting and important technical aspects of how the system works, in particular, how the PCMs and photoswitches interact at the molecular level,” says Grossman. That fundamental understanding has already enabled them to develop systems using PCMs with different molecular structures—notably, with chains rather than rings of atoms—along with photoswitches optimized for each one. In the future, Grossman believes they should be able to develop systems that can store more thermal energy and can operate at a variety of temperature ranges, including the low temperatures of interest for biomedical and electronic applications. G.G.D. Han, H. Li, and J.C. Grossman. “Optically-controlled long-term storage and release of thermal energy in phase-change materials.” Nature Communications, vol. 8, article no. 1446, 2017. Online: doi.org/10.1038/s41467-017-01608-y. in diverse organic phase-change materials.” Chemical Communications, 2018. Online: doi.org/10.1039/C8CC05919E.